What is the 2019 Series about? 2019 marks the 8th Anniversary of the Central Florida Diversity Learning Series! Participants will learn and practice actions which can drive our efforts to build inclusion into every aspect of our journey. How can we demonstrate the actions necessary to create a more inclusive experience for everyone? 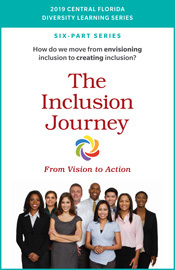 How can we monitor and measure the impact and value of our inclusion actions on our organization’s strategies and tactics to reach our inclusion goals? How can we build systems that support our actions and engage others as we create inclusion paths for all? The learning methodologies for the 8th annual CFDLS are intended to address the diverse learning styles and needs of all participants. The sessions will be experiential and adopt multi-media technologies. All facilitators will be guided to use a variety of methods in each session which will include – but may not be limited to – storytelling, audio presentations (i.e., music, voice), visual / video presentations (i.e., art, photography, PPT, DVD) and internet media, if available (i.e., YouTube, TedTalks). Each session will include resources and references so that participants may continue their education on the topic beyond our session. We will also provide post-session resources on our website. Sourcing of presenters will be intentionally diverse – to appeal to the variety of needs and backgrounds of our participants.